Yes, I have forced you to stare at my ugly toes LONG enough. I finally made time and after a lot of sawing, and filing, and lots of sweat... RayRay was able to help my toes. I had to tell him that my toes looked this bad because I was a runner and that well, my toes take a lot of beating in those shoes of mine. You see on long runs, I tend to curl my toes under... frequently (hence the blisters). I went on and on to RayRay, but after about 5 minutes, he said, "I start now?" See, RayRay doesn't speak much English but he was up for the challenge. No need to delay with excuses. He did say more than once that there was no need to take a hiatus during the winter months. My first thought was: "Why would I spend $20 to make my toes pretty when no one would see them but me?" Oh, but RayRay had this whole rationale about how taking care of the feet and toes takes care of the rest of the body. And so I sat for the next 45 minutes (yes, they were so bad, it took that long) and listened to him tell me the benefits of a pedicure year round. "I feel pretty... oh, so pretty!" 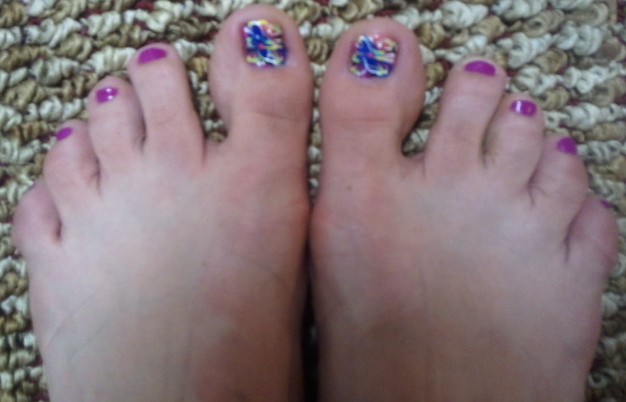 YUP - I had my first Pedi 2 weeks ago before we went to Florida - there will be more Pedi's in my future! Have fun this weekend! Enjoy your run and ride! I feel pretty and witty ... and GBA! Hey crazy chic, I'll be out riding solo "with you" this weekend. Sorry I can't "run" with you too though. very pretty! good for you! you are amazing with your miles!! Look at those cute feet! So pretty! I've never had a pedicure done before, but I'd like to. BTW I'm your newest follower! Check out my blog and follow me back! If you're ever in need of a guest blogger, I'm your gal! Cheers! 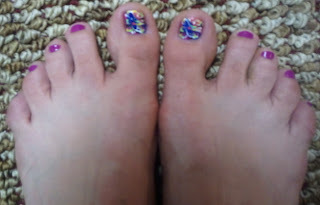 I don't have pedi's now that I run barefoot - it is damaging to my running to take off the tough skin under my foot. But, I do have my nails painted regularly but nothing as fancy as you got. Please send RayRay here! !